Ahead of the 2016 assembly and the upcoming municipality elections, a mass exodus of Trinamool Congress activists to the Gorkha Janmukti Morcha (GJM) camps continues to make life difficult in the hills for the ruling party in West Bengal. 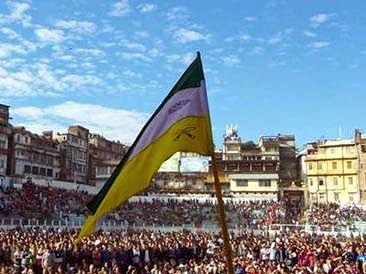 On Sunday, more than 200 Trinamool supporters were handed the party’s flag by GJM president Bimal Gurung in the Patleybas office near Singamari in Darjeeling. Eighty-seven Trinamool supporters from the Sukhia-Maneybhanjyang constituency expressing dissatisfaction with the party policy and leaders joined hands with the GJM party. “We are disillusioned with the party’s policy. The leadership in the Hills is next to nothing and supporters and unit leaders have no direction from the high-ups for any kind of political activities. This makes us redundant. So we have decided to join the GJM which is presently working for the people of the Hills,” lamented Sangey Sherpa, a unit leader from Pulungdung while accepting the GJM flag. Similarly, around 150 members of the Trinamool affiliated Darjeeling Hill Karmachari Sangathan (DHKS) that has remained inactive since beginning of this year also joined the GJM fold. “Several promises were made to us by senior Trinamool leaders including minister Gautam Deb. However nothing has materialized. Since the time of the Darjeeling Gorkha Hill Council (DGHC) we have remained casual workers. We were told by Deb that we would be made permanent,” alleged Dilip Singh, former president of the DHKS. Besides, factors like employment and development of the Hills, most deserters had the Gorkhaland demand utmost in mind. They felt being in Trinamool that is opposed to formation of a separate Gorkha state would send wrong signal to the Hills people. “We too want a separate state. But the Trinamool is opposed to it. We don’t want people to think we are against their sentiments because our aspiration is also that of a separate state,” said a senior Trinamool leader from Sukhia who did not want to be named. The GJM president welcoming the Trinamooldefectors into the party fold and appealed to them to work for the common cause of a separate state. “Our goal is same that of Gorkhaland so why should we be in the opposite side. We must work together to achieve what we have been demanding for over hundred years,” said Gurung. Regarding members of the DHKS, the GJM leader said he would request the Janmukti Asthayi Karmachari Sangathan (JAKS), the party’s frontal organization working for the welfare of the casual workers of the Gorkhaland Territorial Administration (GTA) , to induct the TMC activists. more than 200 Trinamool supporters were handed the party’s flag by GJM president Bimal Gurung in the Patleybas office near Singamari in Darjeeling.